Brea, California Real Estate and Community Info. In the late 1800s, oil wells developed in the area and operated strongly until the 1940s, when they began to dry up. During this time, local businesses catered to the oil industry and the residents were either workers in the oil fields or owned the businesses that supported the workers. Residents and visitors can learn about the city's rich history at the Olinda Oil Museum and Park, developed to bring the oil boom back to life, at least for historical purposes. Later, after the 1940s, Brea real estate included housing developments that sprung up as businesses that were non-oil related began to enter the area. The Brea Mall, built in the 1970s, paved the way for many more retail areas. Olinda Oil Museum and Trail 100 years Celebration October 6, 2012! Brea Mall has several major stores to offer shoppers, including Macy's, Nordstrom, Sears and more. It also features hundreds of specialty stores and a spa. The mall features a remodeled food court and restaurants like The Cheesecake Factory, California Pizza Kitchen and others. There are also shopping opportunities at the Brea Marketplace, the Brea Gateway Shopping Center. A lot of Brea real estate is located within easy access of these shopping areas, and there are many residents who enjoy leisurely strolls through the malls. Birch Street is another popular shopping area that encompasses more than 50 acres and welcomes pedestrians to stroll through its eclectic shops, local businesses and great restaurant offerings. Diners can find food from all ethnic and cultural backgrounds as well as standard American cuisine. There are seafood restaurants, breweries and cozy cafes. Bruxie serves a delectable breakfast and brunch, while the Central Deli and Grill is the hotspot for lunch. For Mexican food, many residents prefer Sol de Mexico. Brea residents enjoy many fun things to do within the city, such as concerts in the park, a July 4 country fair, clubs for the boy and girl scouts, a Brea Lions Club, and much more. They can also stroll through the Brea Museum and Heritage Center to get a feel for residents who lived in the city many years before. Some of the permanent exhibits feature artifacts from as early as 1917. Those interested in playing sports have lots of opportunity at Brea's many golf courses and parks, including Arovista Park, which features soccer fields and volleyball courts. Brea Sports Park has 26 acres of fields plus walking trails and a children's play area among other attractions. There are at least 15 local parks that offer picnic tables, barbecue areas and playgrounds. The Ted Craig Regional Park also offers fishing, as does the Tri-City Park. 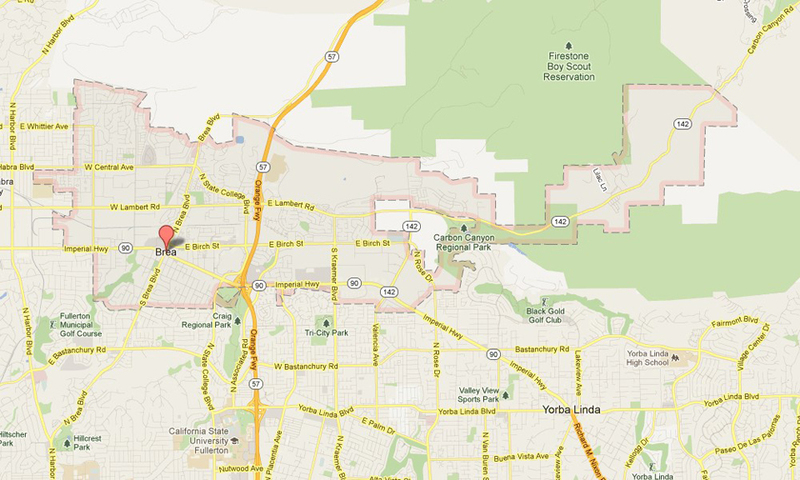 Many of the parks are within easy access of most Brea real estate, and some are within walking distance of local homes. More than 40,000 people call Brea home, and more than 100,000 people visit every day to work and shop. Brea real estate includes areas like Walden Estates, which features 54 single family homes, and Tonner Hills which features 795 housing units. The city offers homes for all types of buyers, including condos, apartments, single family homes and larger mansions. Estimated median home and condo value in the area is just over $500,000, slightly higher than the California average. The city has a warmer climate that residents can enjoy year-round. Most residents have a bachelor's degree or higher, and more than 50 percent of adults are currently married. Many work in management roles, as sales representatives or as top executives. There are also many engineers and computer specialists. The city's crime rate is lower than the national average. There are seven colleges and universities within 10 miles of the city, including California State University-Fullerton and California State Polytechnic University-Pomona. There are several public elementary, middle and high schools in the area, and private schools for all age groups, including Carbon Canyon Christian School. The Montessori of Brea serves children just beginning in school. There are several hospitals in the area, including Kindred Hospital. There are three Amtrak stations within 12 miles of the city as well as bus and taxi services. The closest airports are Long Beach Airport at 16 miles away, John Wayne Airport at 17 miles away, and the LA/Ontario International Airport at 20 miles away.